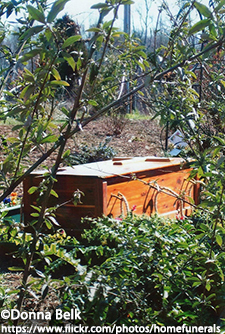 Links to the natural burial grounds are included on the Resource Page. 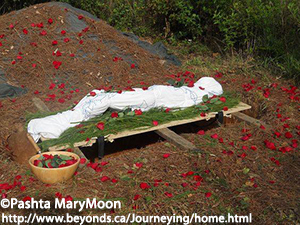 Natural or green burial is legal in all provinces in Canada. It is not a legal requirement for a dead body to be embalmed. There 3 natural burial grounds in Ontario – Union Cemetery in Cobourg, Meadowvale Cemetery in Mississauga, and Duffin Meadows Cemetery in Pickering. All three of these natural burial grounds require that the body not be embalmed, and be in a natural, biodegradable container, including a shroud, however at both Meadowvale and Duffin Meadows, a shrouded body needs to be placed on a rigid board – a simple piece of plywood would suffice.